Recently there have been several excellent articles in Low End Mac about the use of computers in schools. I enjoyed reading iMac DVs in Action, Old Computers in Our Schools, and Apple's eMate Still a Great Tool in the Classroom. There is nothing like reading about tech departments using it up, wearing it out, and repurposing computers to meet student's educational needs. There is never enough money for schools in general - and for technology in particular. Like the dualist I am, I must make a case for both cutting edge technology and low-end technology in public high schools. I am receiving a whole new set of iMacs for both the graphics lab and writing center that I watch over. I can monitor both labs using Apple Remote Desktop (ARD), and this is a really good thing to do. Using ARD means that I can restart, login, shut down, and open applications on all these computers at once. I can also help users without having to leave my desk. It also means I can find students doing things they shouldn't be on the Internet. Time for today's rant: You and I and educators everywhere think that computers can be used for academic purposes. Silly adults. Teenagers look at the World Wide Web and immediately head for the red light district. Or a number of game sites. Or YouTube. So instead of using their computing skills for good, they have gone over to the dark side. Having new computers that run the latest (Mac OS X 10.5 "Leopard") software is great. We also can make use of the newest developments in educational software on the latest networking features of OS X. And, as Mr. Mike, our computer tech says, "There's nothing like the smell of new plastic in the morning". We're geeks; we like new electronic stuff. But there is a need for low tech here in Hormone High as well. As I mentioned, students tend to view computers as a gateway to entertainment, and entertainment is a distraction for today's frenetic students. 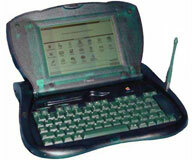 There is a need for computers that just work on academic things - like the eMate. We don't need students surfing the Web while they supposed to be writing. We need students to learn computer skills, but not necessarily the ones involved in evading security restrictions. Naturally, there is a fly in the ointment. High school students want laptops with Internet access. Not because they can do "research" on them, but because they don't really want to do work on them. (Motto: ABA - Anything But Academics) The real niche for an eMate type product is in the elementary school and middle school markets. Our suave and sophisticated high school students view the AlphaSmart products as too "five minutes ago" to deign to use them. I personally have a bunch of old PowerBooks that can be used as word processors. I digress. When you are a medium sized (for a rural area) school like us, systemization is important, networking is important, and the latest equipment is important. But smaller schools require smaller solutions, and perhaps the best way to introduce computers into a student's toolbox is with a simpler tool. While next year I look forward to my new toys, I'm going to hang on to the PowerBook 500s and 180s for another year.